The Letcher Fire Department poker tournament and fundraiser was held Saturday, Jan. 19. 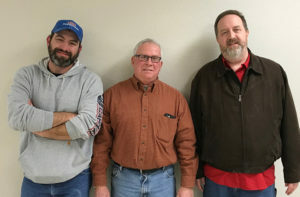 Winners of the tournament are pictured, left to right: Gary Spelbring (third place), Harvey Fouberg (second place) and Pat Smith (first place). A soup and sandwich meal was served prior to the poker tournament with a free will donation. There were about 70 people in attendance, 44 of whom were players. The Texas Hold-em style tournament is an annual event for the LFD. 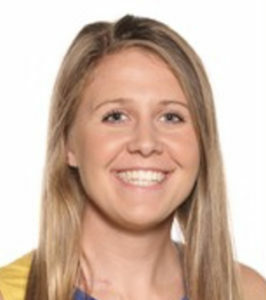 South Dakota State University sophomore Myah Selland, who is a Letcher native and Sanborn Central graduate, was named Summit League’s Player of the Week for the first time in her career. The Jackrabbits Women’s team are now 12-6 on the year and 4-1 in the Summit League. Their next game is Friday, Jan. 18 at 7 p.m. at UND. …Read details in this week’s issue of the Sanborn Weekly Journal. Letcher American Legion hosted their annual Santa visit and Turkey Bingo Saturday, Dec. 15. Santa arrived at 6 p.m. to visit and hand out sacks of treats for the kids. The Auxiliary served a lunch of BBQ’s and pies. Bingo, to win a turkey or bacon, started at 7 p.m. A large crowd of over 100 people were in attendance. The Legion sold chances for a cash drawing and the winners of the money were $100 to Kaylee Adams, $50 to Lila Stach, and $25 to Edith Moe. It was a great night of fun and visiting. Thanks to all who came to support the Letcher Legion. …See pictures in this week’s issue of the Sanborn Weekly Journal.